Yes, it is getting close to Christmas time and the house is getting decorated with festive trees, yule logs, and candles. There in the front of everyone's mind is the giving and receiving of presents. The little ones are definitely thinking about the upcoming visit from Santa. That means children are trying to be good because they know Santa is watching them. No child wants to be left with coal and switches on Christmas morning, so they attempt to behave better. Children and adults wonder just how does he accomplish watching so many children the world over. Why, he provides little red-suited elves to keep watch on the children, returning each night to Santa with an updated report. The answer is so simple. 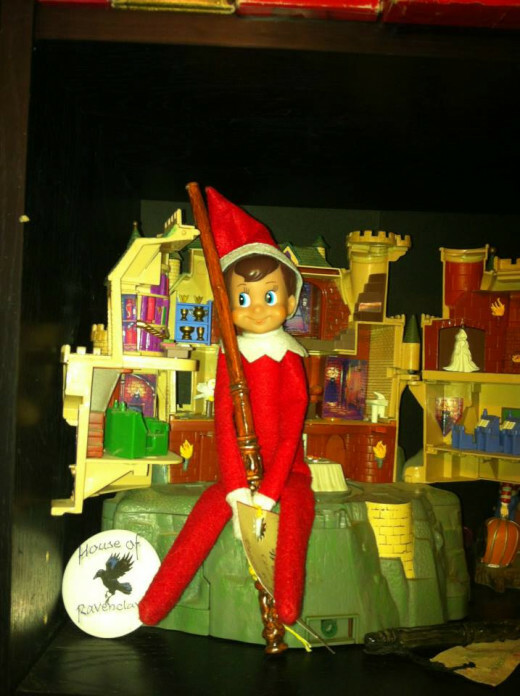 Since 2005 the little flexible elves have been showing up in houses, creating mischief and being quite entertaining. 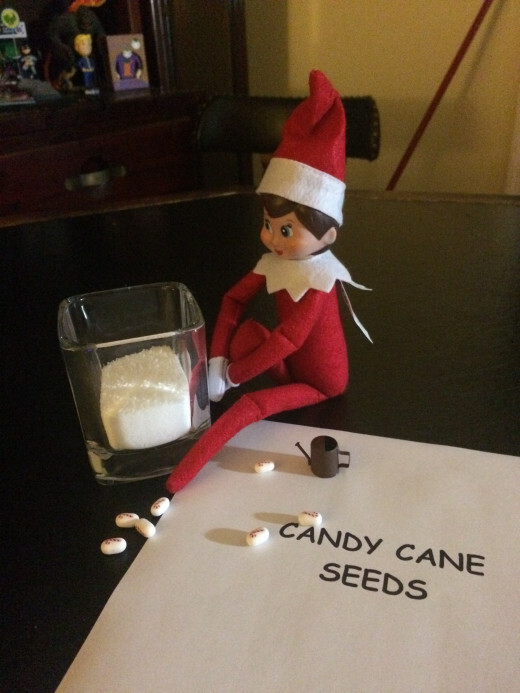 Suddenly parents wake up to find the little scamps sitting in a pile of sugar passing out candy cane seeds, that when planted in the bowl of sugar grow into full-sized candy canes the next night. These are fun because they give the child something to anticipate for the next days. One night the elves crept into the bathroom and set up camp on the vanity. 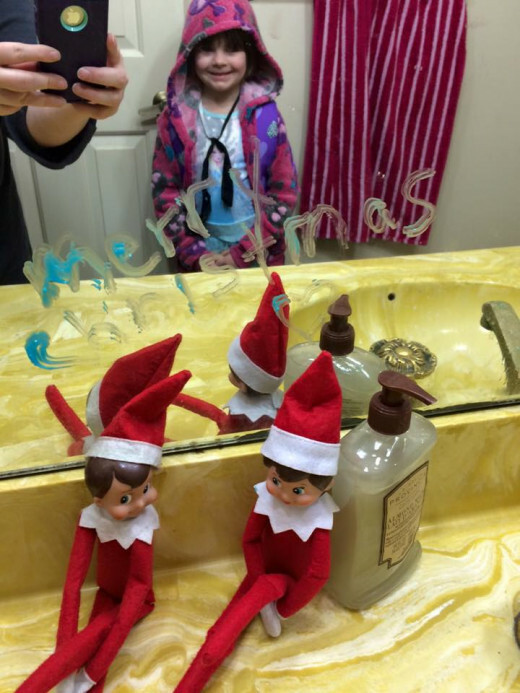 They wrote a happy message in toothpaste so that she would know they wished her a merry Christmas. The toothpaste comes off the next day pretty easily with a little Windex and some elbow grease. 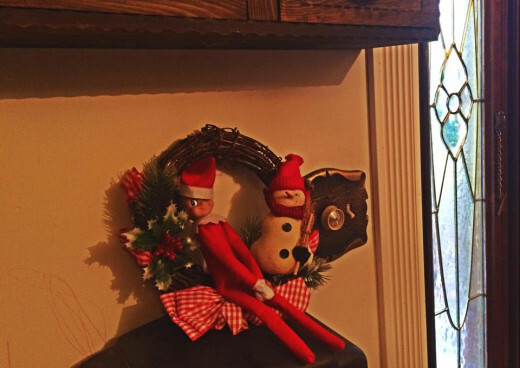 Since we inherited a new elf this Christmas season, they have been quite a bit more active. They seem to enjoy group events like canoodling on the little chair in the foyer. It was quite fun to wake up to them snuggled under the mistletoe. It got quite a chuckle from the six year old. How many Elves would you want at your house? One is plenty for me, They keep me busy enough alone! Give me a couple so they can play together all night long! 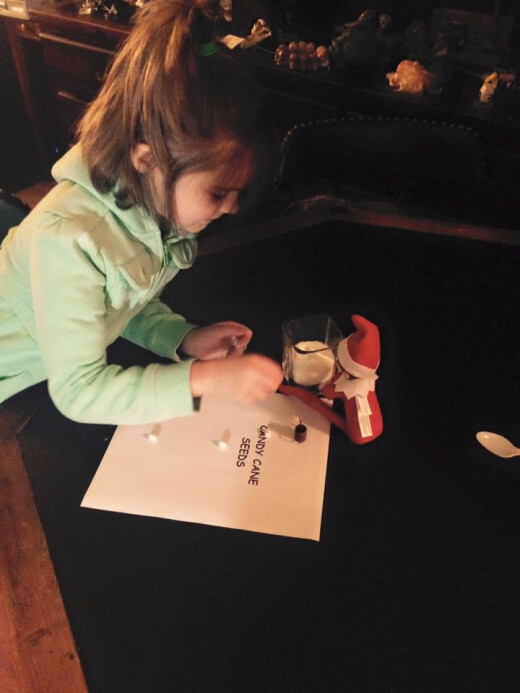 What fun is an elf just sitting on a table? So get creative with the props. 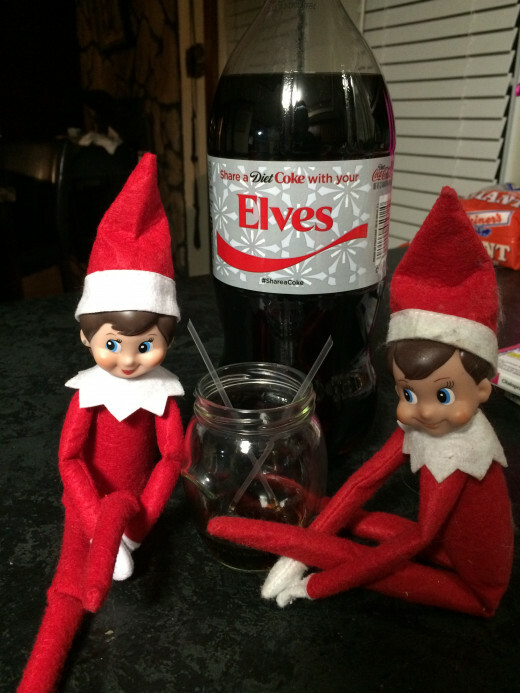 A bottle of Coke with those cute little festive sayings is a good way to help the elves enjoy sharing a glass of soda. 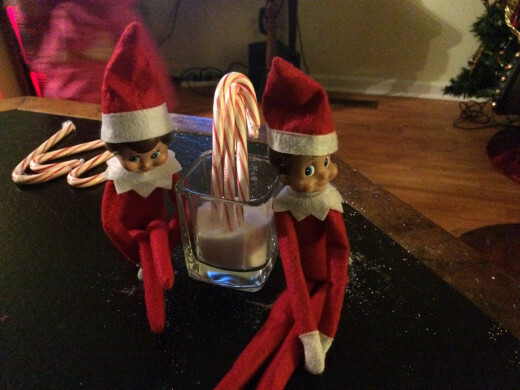 We have two elves this year so one glass with soda was shared by them both. Provide them with a couple of straws and they are cozy and comfy on the kitchen table ready for a little caffeine. That of course can work with one or more elves. 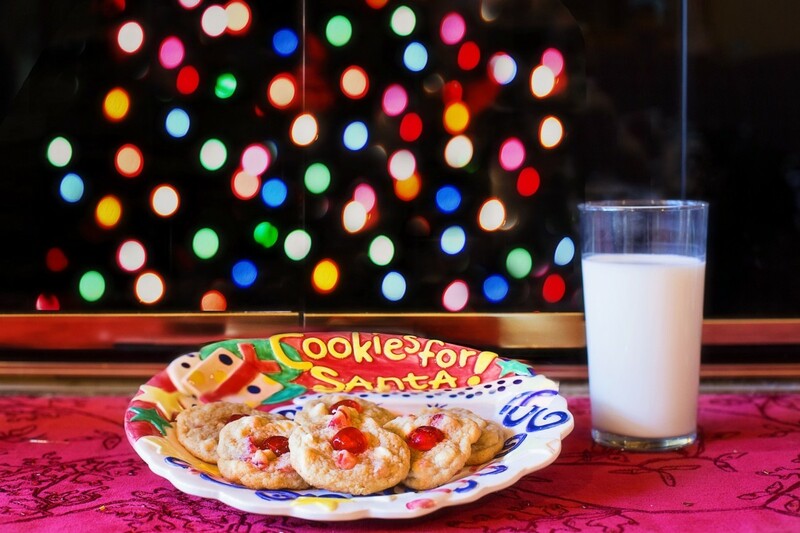 Have the elves bring out the cookie dough and canned decorating icing and these edible props can be the basis for a night of cookie making fun for the family. Remember to refrigerate the cookie dough once the children have seen the scene. Nothing gets a child in the Christmas spirit more than making home made slice and bake cookies. The littlest hands can be involved in this activity. Perhaps you have a dragon or butterflies hanging from a ceiling. 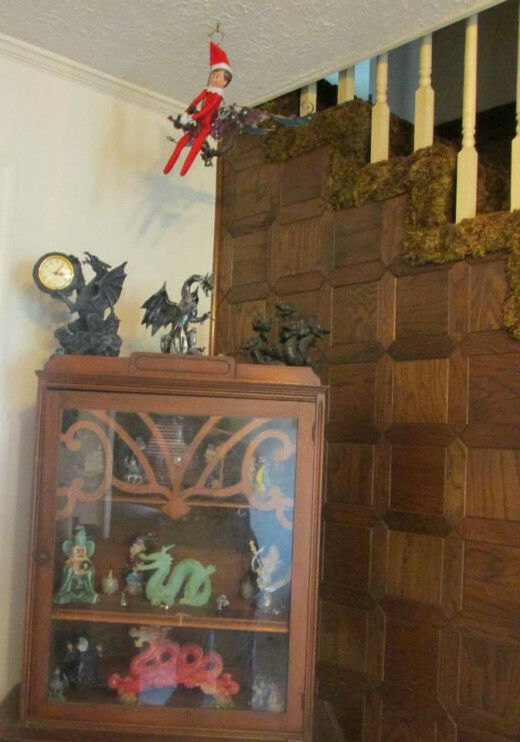 Yes, we do have dragons hanging from the ceiling at our house. The elves might want to hop onto the back and ride. Looking over the house from on high. It is quite a sight as you can see from the pictures below. Props make the elves life just a little more fun and will add to the magic for the little one in the house. 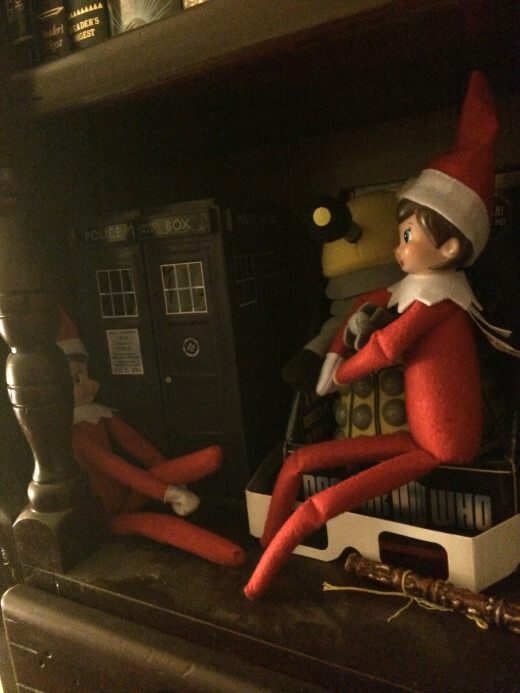 Our elves, Jingle and Trixie, are fans of Dr. Who, Alice and Wonderland and Harry Potter. So they spent one night each with the character dolls and toys. 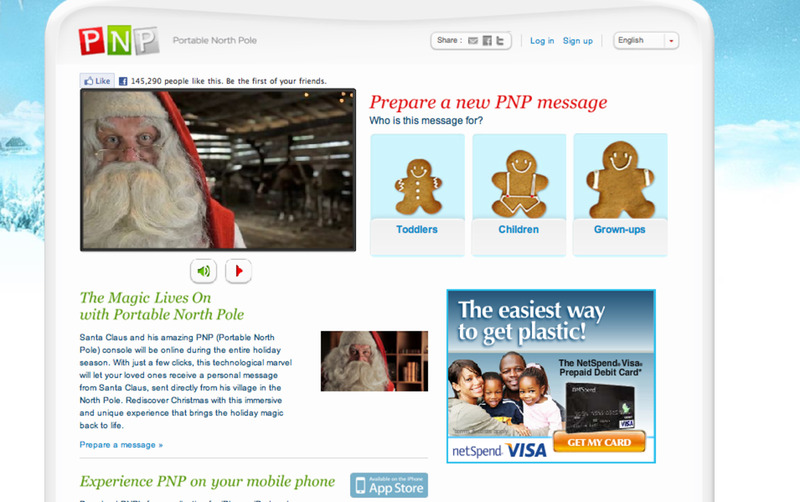 Take a look at some of the pictures below and maybe your elves will get some similar ideas. 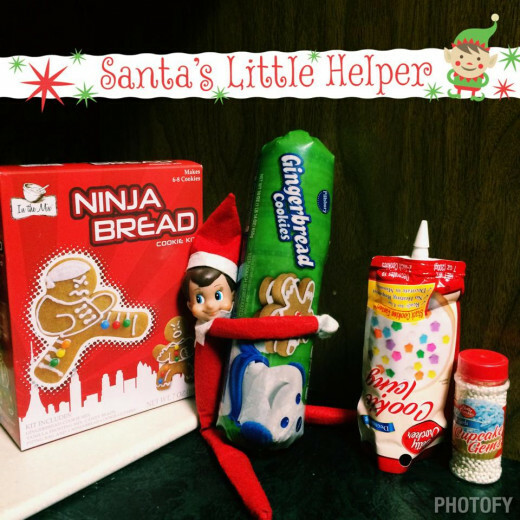 These elves sometimes have simple messages for the little guys at your home. We had an elf show up with candy canes and a message from the big guy himself letting us know that Mrs. Claus had put him on a diet. It was very generous of him to send the elves back with those candy canes. They were certainly a hit. 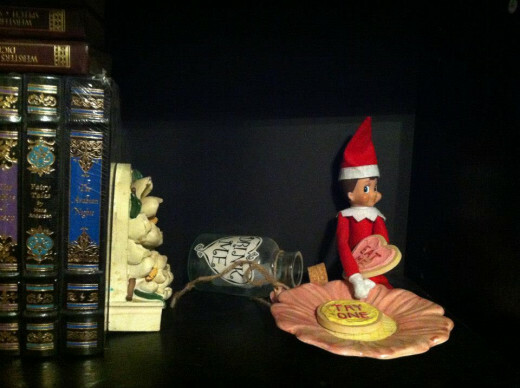 There was a little incident with our elf, Jingle one day. Seems like the five year old just couldn't resist touching him. 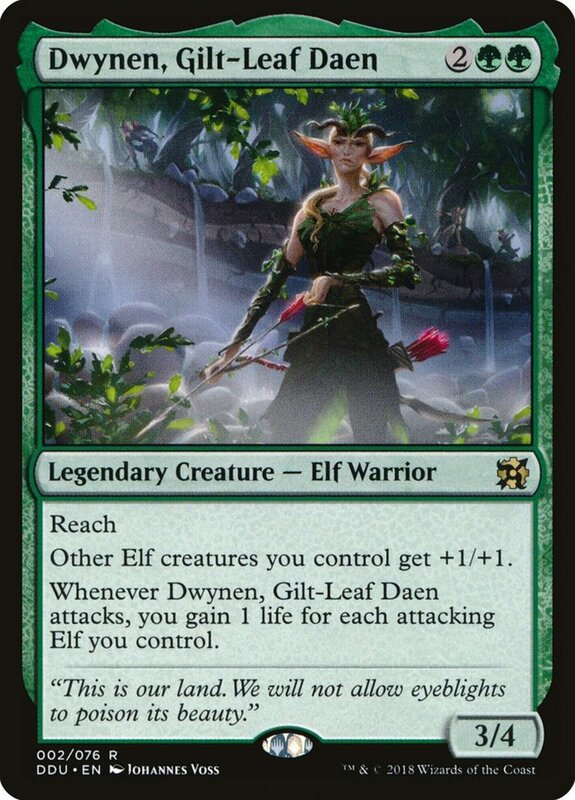 That is a big no no for the elves as it takes away their magic. So the elf disappeared that night and did not come again for two days. When Jingle came back he brought a sign asking the child to "Stay Back". 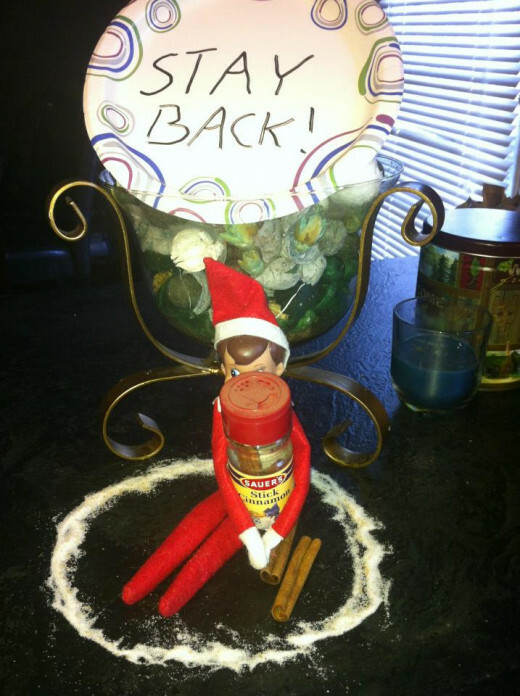 The elf took no chances and placed a magic circle of sugar around his body as added protection. The five year old got the message. 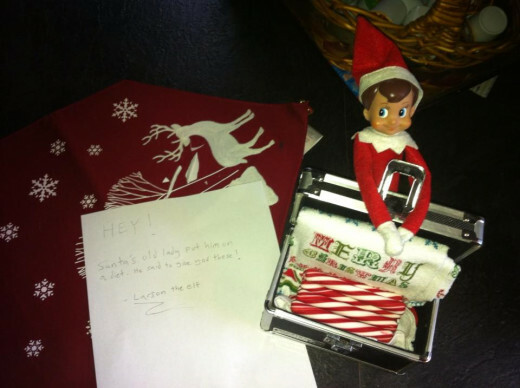 She has been very careful around the elf ever since. 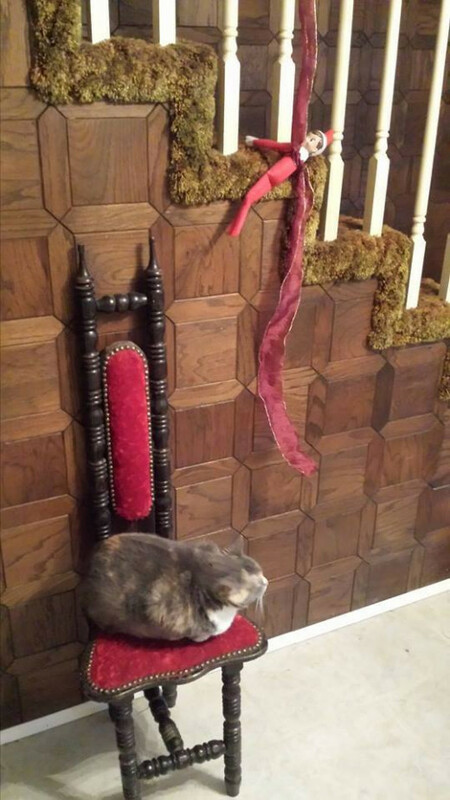 Sometimes the elves just do not have the time to plan out a big display for themselves. That means they just just find a decorative place to sit and wait to be found. 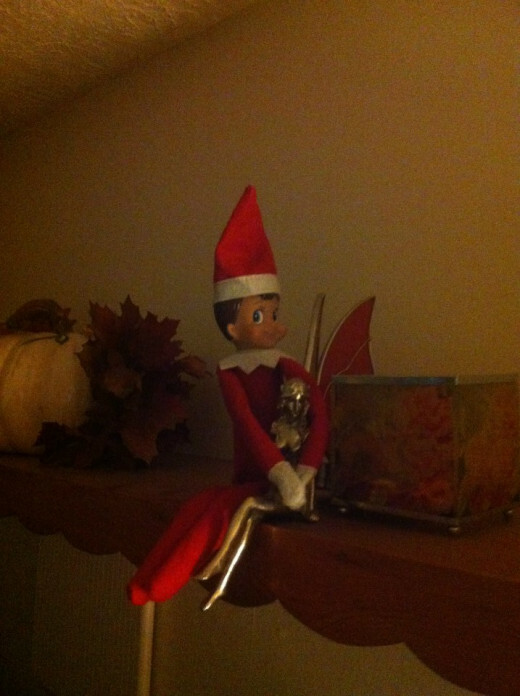 One morning we woke up and the elf was snuggling a fairy that was sitting on a shelf minding it's own business. 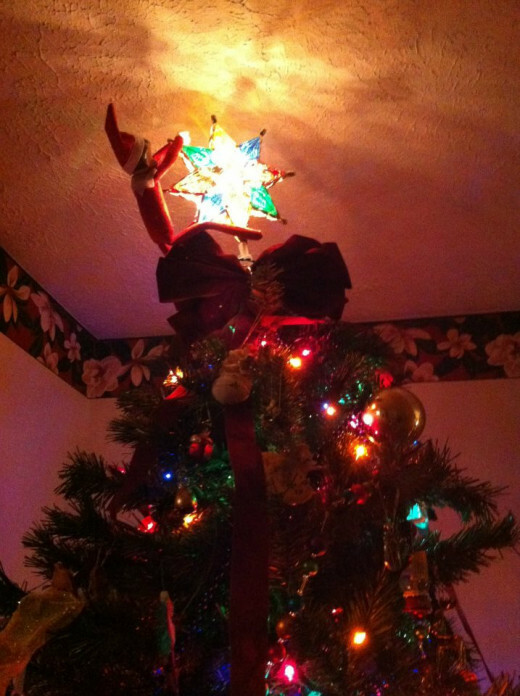 One night Jingles, our first elf climbed the Christmas tree and adjusted the star. Elves are very helpful on occasion. We had the elf that perched himself on a wreath near the front door and watched out for us as we slept. A very considerate elf he was that night. Then it seems that our elf felt he needed to check the durability of the stocking to make sure it would support the weight of all those oranges and candy canes that Santa was going to bring. 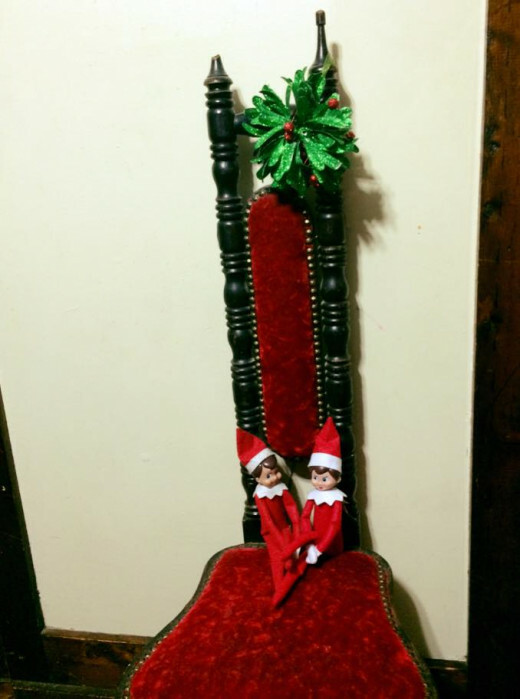 I have to tell you about the one morning that we woke up to find the poor elf tangled and dangling in the garland that had been draped along the banister of the stairs. 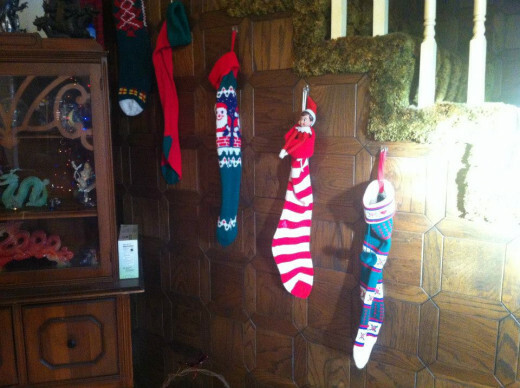 Not only was Jingles, the elf, dangling four feet off the ground, but he was being watched by the household cat. It was a very scary night for that poor Jingles. Remember the elves sometimes like to just keep it simple. 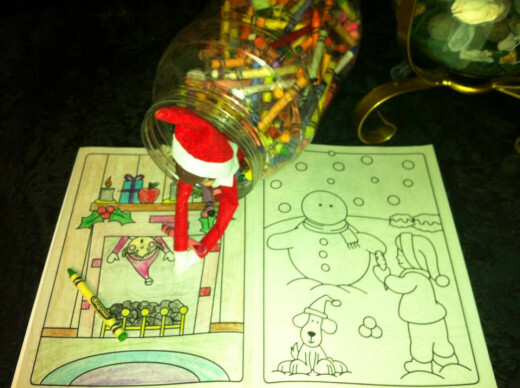 Elves love to color in coloring books that can be found in any child's bookcase. It passes the night away and gives them a work of art to share in the morning.